Join highway A-44 towards exit 129 “Recogidas“. Continue on Neptuno street until you reach the end of Calle Recogidas. Then head to Reyes Católicos street and further on to your right you will find Plaza del Carmen. Nest Style Granada is at the bottom on the right. 2 Carry on walking down gran vía and turn right onto calle reyes católicos. 3 Continue down this street until you arrive at Plaza de Carmen. About 150 metres from Gran vía. 1 When you leave the train station continue walking up towards calle Faisán, the only Street there. 2 You will arrive at avenida del sur and on your right there is a bus stop. Take line 4 . Line 4 will take you to the main street Gran Vía de Colón. The last stop on the street is where you must get off. 3 You will be next to the cathedral. Carry on walking down Gran via and turn left onto calle reyes catolicos. 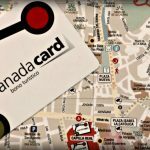 BY BUS After leaving the terminal, take a bus labelled “Aeropuerto Granada” it goes to the centre of the city. Get off at stop Gran Vía 1 ( infront of the catedral) carry on walking down until you reach calle reyes de los católicos on the right. Carry on walking down until on the left you see a big plaza, Plaza del Carmen. IMPORTANT INFORMATION: Guests are permitted to pass through Calle recogidas, Reyes Catolicos and San Matías. We must inform you that it is strictly prohibited to pass through Calle GRAN VÍA DE COLON. Avenida de las Fuerzas Armadas, nº4. In case of accepting the appeal, the City of Granada will send you a withdrawal notification by mail.